On 2015 April 14th, I was able to use the splendid 150mm OG Cooke rafractor at Hampstead observatory. This is fine instrument with a long a rich history for visual planetary work. Seeing conditions were excellent and we observed both Venus and Jupiter. 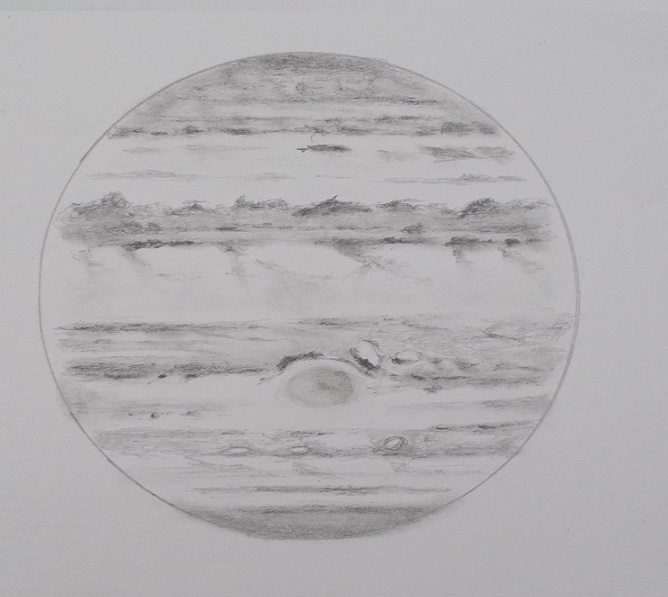 I made several drawings of each of the planets (see below)- the telescope really did perform for us! Illuminated disk: A number of darker markings present on the disk, views were subtly different when various filters were employed. Bright Limb Band: Visible and complete. Cusp Regions: Once more the northern cusp cap seemed larger than its southern counterpart- this seemed to be the case in all of the filters used and in integrated light. Similarly both cusp collars seemed to be present. SEB broad with a number of interesting sections within. The EZ contained a number of festoons distinctly bluish in colour. NEB was rather active: the northern boundary was rather irregular and a number of lighter sections and dark patches could be easily made out within. NTB and NNTB very hard to define, indeed this part of the northern hemisphere at these longtiudes seems to have a somewhat homogeneous look. In the second drawing, Ganymede can be seen making a transit in the EZ. A note of the transit of Ganymede. At around ~2100UT, Kevin commented that a satellite shadow seemed to be present in the EZ. I viewed the planet myself and made a drawing (drawing 2 attached). The marking did indeed appear to be a shadow for it was a very dark grey in colour. When I got home the next day and ran a WINJUPOS simulation, the program revealed that it was in fact Ganymede making a transit. I have viewed Ganymede making a transit across the disk many times, but I have to say this is the darkest I've ever seen it in transit. I can only presume that a contrast effect was resp[onsible since Ganymede (which is a dark satellite anyway) was viewed against the bright white of the EZ. All the same it was an interesting view! I'd like to thank the staff at Hampstead Observatory for making the observatory available for me to use. Edited by Paul G. Abel, 17 April 2015 - 09:34 AM. 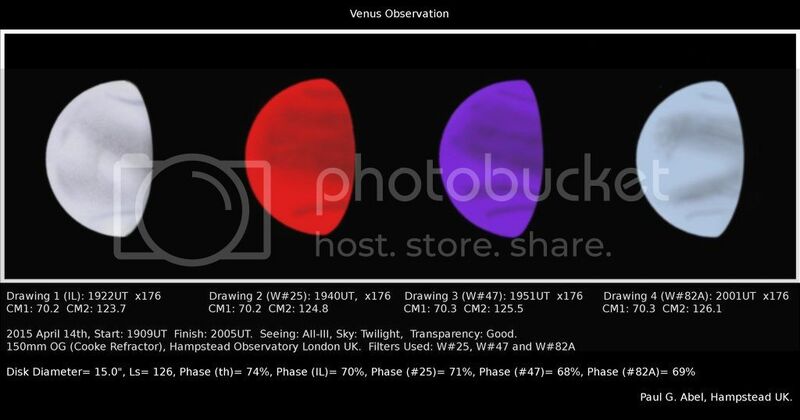 Nice sketches of Venus & Jupiter . 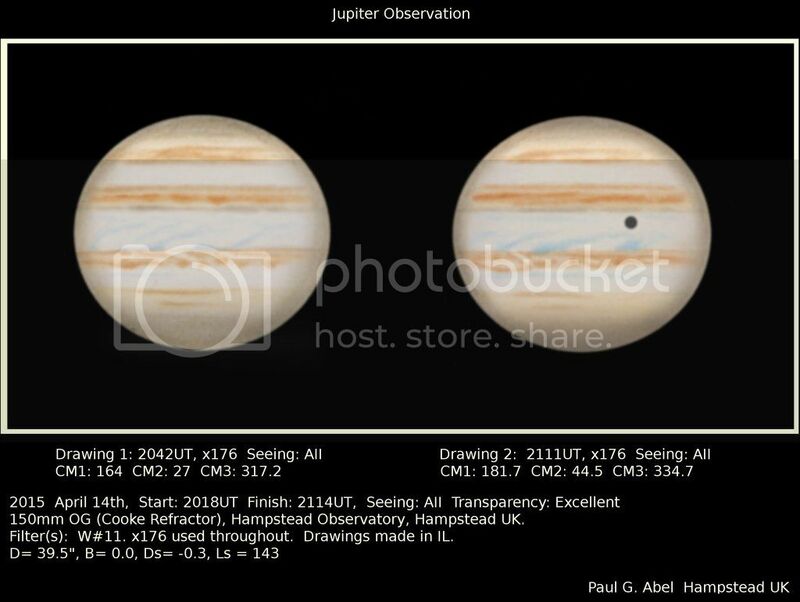 Sketches of both planets very impressive. You did superb planets observations, and via such antic lens this is must be a good time. The same night, from 18h40 - 19h20 I observed Venus as well. I have to say that yours are much more interesting than mines ! For this kind of observation, the refractors are a must! Wonderful report and sketches Paul! Looks like you had a fine instrument and good seeing at hand. can still rock-n-roll with the rest of them. have a very ghostly appearance, however you and the Cooke have done a very good job. with the scope. Hope you don't mind but here is a sketch I made a few weeks ago now. My lens benefits from multi-coating, however that old Cooke is doing a wonderful job. Dear Rutilus, what a great sketch! I am really excited.